The birthplace of Mozart has a picturesque Old Town that has been classified as a UNESCO World Heritage Site and is the home of magnificent castles, palaces, and cathedrals. 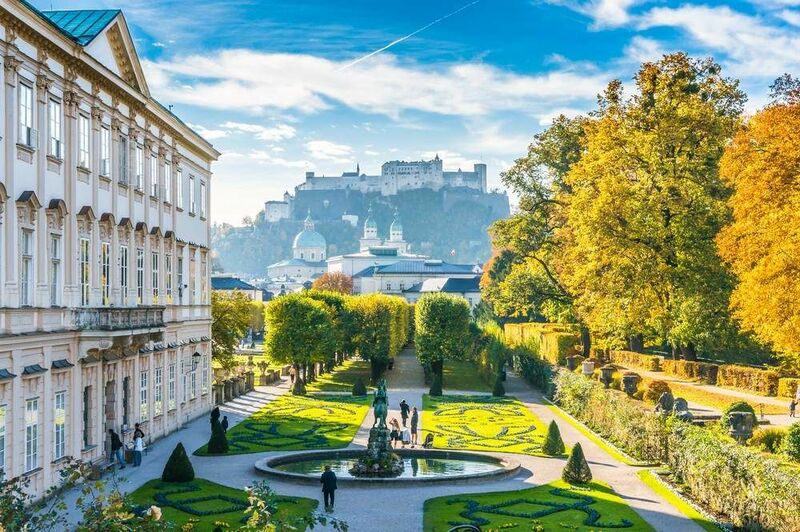 It is no wonder that Mozart grew up to be the creative mastermind that he once was, growing up in a stunning city such as Salzburg. This Austrian city was also where the famous "The Sound of Music" musical, starring Julie Andrews and Christopher Plummer, was set and where many scenes were shot. In Salzburg, you can also find Central Europe’s largest intact fortress, Hohensalzburg Castle, an enormous 11th-century building that offers fantastic views of the city. Some of the other top attractions in this incredible city include the UNESCO World Heritage Site, Mirabell Palace; a baroque villa and Renaissance building, Hellbrunn Palace; and St Peter's Abbey, a monastery and former Cathedral. Experience the city of Salzburg like a local by taking a long walk through its streets. These walking tours will guide to the best places to see in the city. Those who grew up watching the “Sound of Music” movie will certainly want to take this self-guided tour of Salzburg. Walk through the city of Salzburg, visit the main attractions, and learn about the history of the landmarks and majestic buildings. Stops in the tour include Mirabell Castle and Mirabell Gardens, Nonnberg Nunnery, and the Felsenreitschule and Festival Halls. Big Boy Travels has a guided tour of the Old Town of Salzburg that is ideal for those visiting the city for the first time. This 2.5-hour self-guided tour will take you to the top landmarks of the city, teach you about the history of Salzburg's UNESCO World Heritage site, and let you modify the tour according to your interests and time. There is a total of 29 attractions, and a printable map outlying them all for your convenience. Travel Yes Please has another very informative and entertaining self-guided walking tour. Visit the Old Town of Salzburg, stop by the City Hall, visit Mozart’s birthplace, and strolls through the city’s popular shopping street, the Getreidegasse. You will also hit the iconic landmarks of Salzburg including St. Peter’s Abbey, Chapter Square, Salzburg’s Cathedral, and Residenzplatz. Below you can find more popular (but not free) activities and tours in Salzburg. Are you from Salzburg and want to be a tour guide? Please get in touch by submitting your details on this page!